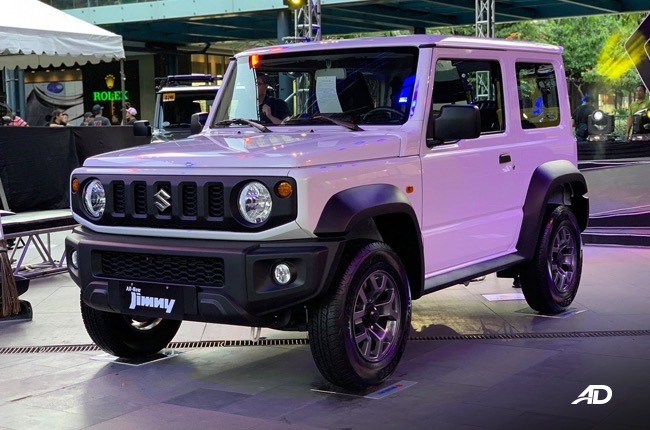 Is the base 2019 Suzuki Jimny GL worth the bucks? 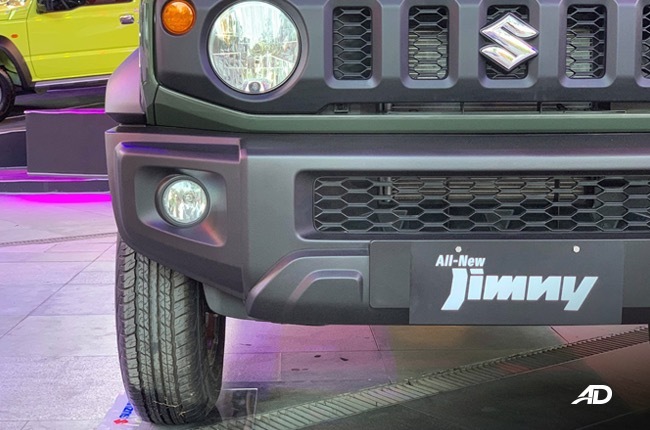 You are here: Home Latest Stories Feature Is the base 2019 Suzuki Jimny GL worth the bucks? 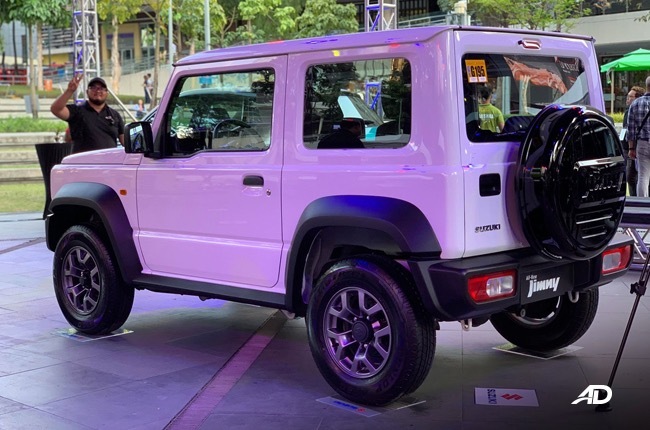 It’s quite impressive how Suzuki Philippines was able to sell the first batch of the 2019 Suzuki Jimny the very night it was officially launched. 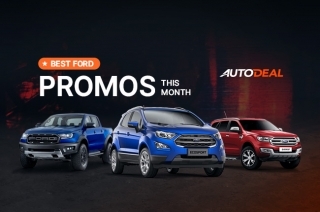 It’s not that surprising, though, because if you think about it, a capable off-road machine for around a million bucks is a sweet deal – especially the base variant, which is below the million-peso mark. Base variants are often referred to as the stripped versions of the fully-equipped model – the model that’s more expensive with optimum safety, comfort, and tech features. Normally, there are a lot of sacrifices done to trim the price tag and, sometimes, comfort ends up being compromised. Is this the case for the base variant of the Suzuki’s mini 4x4 SUV? We’ve experienced the top-range variant on a quick test drive so we wanted to know if the base trim managed to keep the things we liked. For just P975,000, you already have an SUV that’s honest with its off-roading capabilities, aside from the sleek and aggressive appearance. 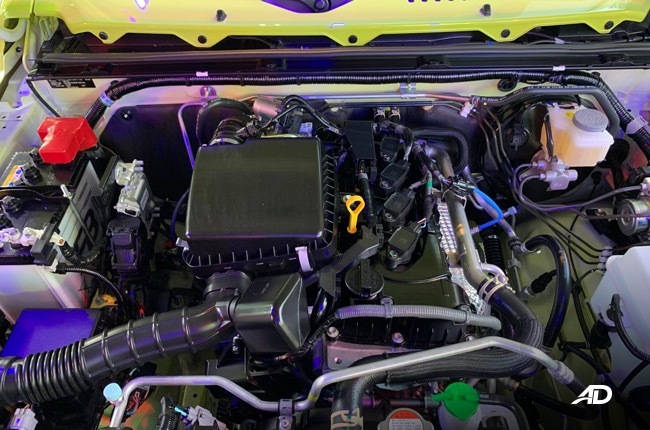 Enter the 2019 Jimny GL MT, the cheapest new-generation Jimny being offered in the Philippine market to date. And, in contrast to the norm in base model variants, the GL 5-speed manual (MT) is surprisingly well-equipped – just a few features were taken out but what’s left is still pretty good. Unlike other models, the 2019 Jimny doesn’t differ in looks, regardless of what variant you’re eyeing at – no exterior discrimination, whatever you want to call it. The only visible difference between the GL and GLX variants are paint finishes on minor exterior elements. This includes the door handles, side mirrors, and roof – the top-range GLX features body color painted handles and side mirror covers, as well as a blacked-out roof. There are a few aspects on the GL MT’s exterior, however, that differ from higher-end variants. The base variant offers Halogen headlights that are not automatic, as compared to the auto LED lights with lamp washers on the top-of-the-line GLX AT. Apart from that, we can assure you that things are pretty much the same. If you’re worried about comfort, you can relax those managed expectations now. That’s because the stripped elements inside the GL MT won’t compromise overall comfort, as the basics are still intact. 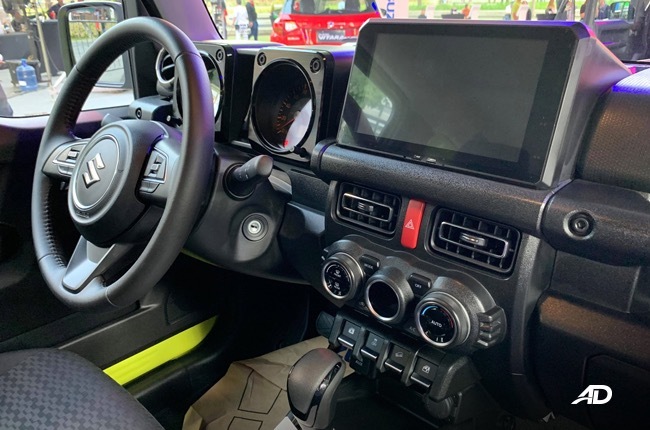 The GL MT’s cabin is pretty much the same as the higher variants, minus the automatic air conditioning, vanity mirror and ticket holder on the sun visors, a 12-volt socket in the luggage room, and a leather-wrapped steering wheel. See, not really a big compromise if you think about it. In terms of technology, the 9-inch capacitive touchscreen in the GL MT has fewer features than the higher variants. To be more specific, there are no indicators for pitch, roll, a compass, barometric pressure, and altimeter information displays on the main head unit. That may be a big deal to serious off-road junkies but you won’t really need them much in the city, right? Though we admit, those might be essential for some buyers. Now, if you consider yourself an avid user of the cruise control feature in your current vehicle, you might be disappointed to find out that there is none in the GL MT. There’s also no brake assist function and reverse parking camera, which can be helpful in some instances. That could be a letdown but you must know that the hill-hold assist and hill-descent control are standard across the range, not to mention there’s a reverse parking sensor on the GL MT so the need for a camera is kinda mitigated, as it is a relatively tiny SUV. Technical specifications are all the same; same engine size, same power output, same drivetrain (4WD All Grip Pro system), and the same suspension system. The only thing that will make a difference is that you’ll be manually shifting the gears with the GL MT. Also, the base GL variant is 20 kg lighter in terms of curb weight compared to the GLX. Now, that might affect the variants’ fuel economy. It could also mean that you have an allowance of 20 kg for cargo if you’ll ever need it. Answering the question whether it is worth it or not, we’d say it is. 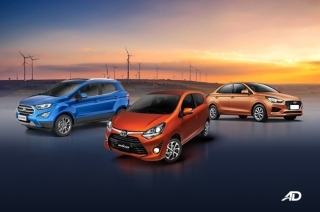 It may appear to be a little pricey for a 4-seater vehicle, but you have to look at the plethora of features and perks you’d get. In our face-off article of the Jimny, we learned that there are an impressive approach, ramp breakover, and departure angles built into the 2019 Jimny’s architecture. 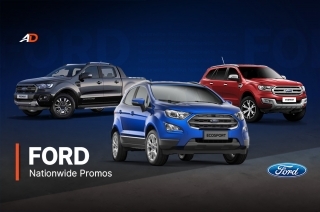 What other vehicles below the P1-million mark have these? We could be looking at a formidable 4x4 platform here. Hi, I would like to receive a financing quote for the Suzuki Jimny GL MT, thank you.